It's not until you use something that you learn how good your design works. Last year i was working with concepts and I knew I needed a house battery, or batteries. I also knew that I wanted to use existing Prius space and my house batteries would be 12 volt gel cells. Then the question was how to charge the gel cells. There is a company that sells 12 volt gel cell chargers but this wasn't the path I took as I also wanted to be able to charge and condition my Prius 12 volt battery. With time running out last year I left with the ability to have a cord from the house battery and another to the Prius 12 volt battery and had to plug and unplug the cables as I chose to charge one or the other. Mostly I charged the house batteries. 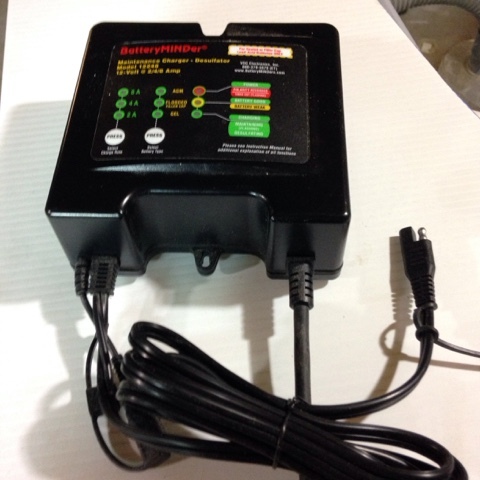 I had to plug and unplug even the house battery as the charger design is that once a battery is plugged into the battery charger the power from the battery is exchanged with the charger and the charger lights are on. That meant that as long as I was charging all was good but once I stopped charging the battery was feeding the display of the charger draining the house batteries. This resulted in two problemsat year I wanted to solve. 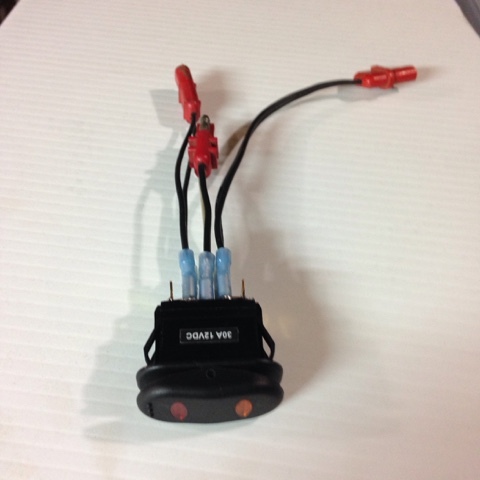 The solution was a double pole / double throw switch / with a center position (on/off/on) where there is no center connection. I selected this switch with lights but the lights can't be used as the outputs of the switch are batteries and not powering a load. The power back feeds and keeps the lights lit even when the switch is in the off position. I dressed the switch with some old connectors to match the charger cables. I have the charger mounted the on the drivers side rear. 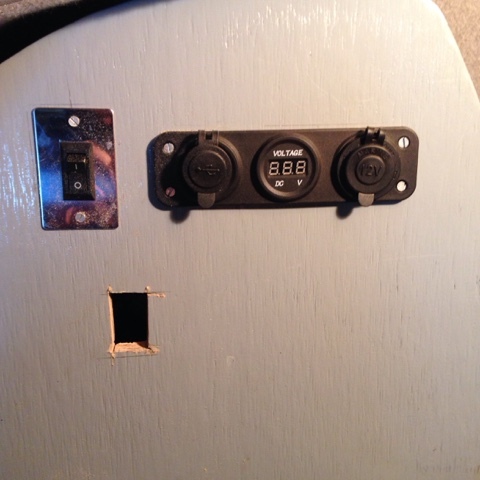 I selected the spot and used the vibrating saw to cut the switch hole. Then I put the switch in and cabled it. The switch on the upper left supplies power from the house batteries to the panel on the right. The center is the voltage monitor and the left is the dual USB charger and the right is a 12 volt car outlet. 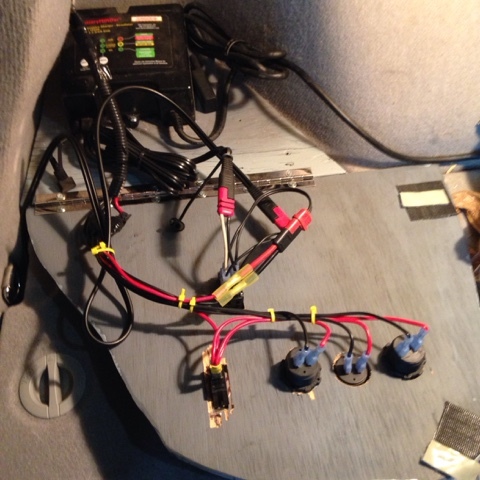 Here is the charger and wiring to and from the two batteries as well as the power distribution for the house batteries. I use this flat heavy duty power cord to the orange power cube to feed the charger. 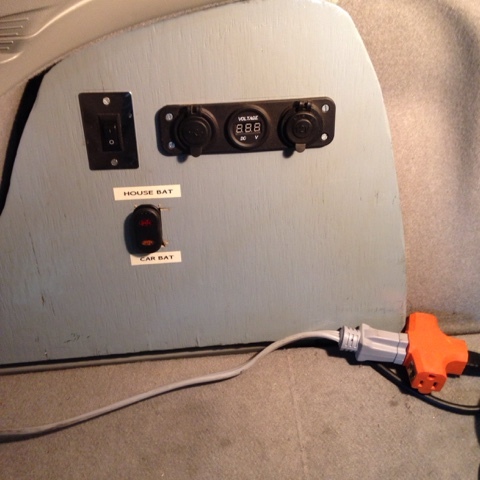 The cube allows for me to power other AC devices while on shore power. The flat cable fits nicely through the hatchback gaskets. When not on shore power I charge the house batteries through a pure sine wave 400 watt inverter from the Prius 12 volt battery on the opposite side rear on the Prius. Brenton; so...if I just wanted to add a second and higher amp/hour battery for "house stuff" (lights,radio,tv etc) I could then just plug an inverter into the Prius 12v socket and then plug a charger into the inverter...then hook up the charger to the 2nd battery....leave the Prius in "ready" condition and it would automatically recharge the 2nd battery AND keep the stock "starter" battery charged up also ? Also, do you have any pics of your Prius all loaded up for a 7-10 day trip? Lastly, any pics of what your typical campsite looks like ? You have the concept correct but there are some stumbling stones. 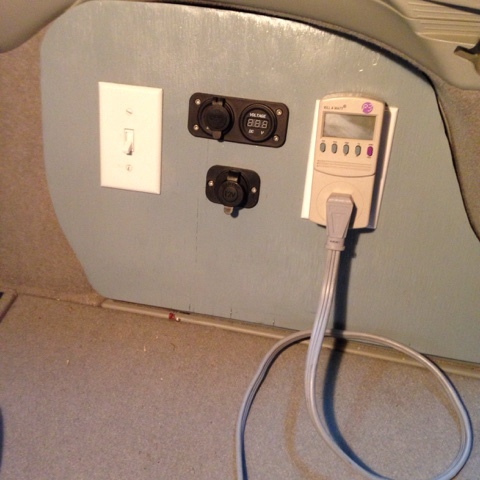 Your Prius cig outlets may only handle 10 amps - I made separate fused connections to my Prius 12 volt battery dedicated for 12 v outlets and a #4 ga wire to my inverter directly off my 12 v Prius battery. So when I'm running fridge and inverter to charge house batteries at the same time I have little loss in wiring and I'm not overloading Prius circuits. Now for battery. I use 3 - 12 volt 8ah gel cells for 24 ah and I get to use half of that. It will give me 8-12 hours of running fridge overnight without running Prius. So yes - leave Prius in ready mode and high voltage (drive) battery will supply Prius 12 volt battery and will start the engine to rest poky the high voltage battery. I do this every day I'm on the road to keep fridge running and charge my house battery. 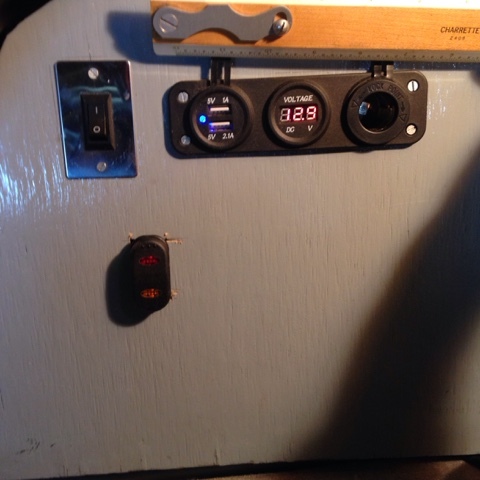 My blog has pic on how my Prius is set up. I can go for a week with out supplies easily. My Prius is set the same way no matter how long I go for. My campsite is very lean. I have my table I cook off of that goes between the door and door frame. My backpacking chair. I also use a tarp for shade once in awhile. That is it, everything else is in the Prius and I am seconds away from moving along to another place as I have few things to manage outside the Prius. I appreciate your questions and what works for me may not work for all. I have worked to get to a level of simplicity.